jtman transforms your Windows computer system into a server station for print job management. An elec­tron­ic job ticket is automatically attached to the print job for each printing operation. The authors enter their information such as the number of copies, paper selection and delivery address in the form and »print« the job. The in-house printer receives the job together with the job ticket, and can process it in accordance with the requirements using the virtual jtman/CRD Business 3 driver with all of the system functions, with no misunderstandings. 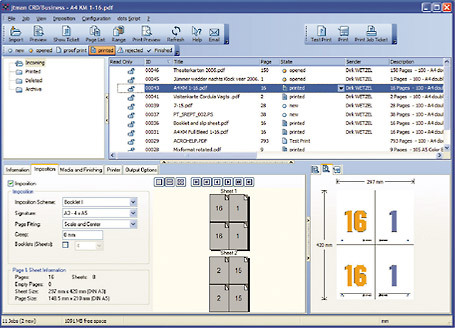 The job ticket request allows adaptation in the event of changes in the in-house print shop, such as support for new print products with a new printing system, for example. This prevents time-consuming and costly incorrect print runs. All systems that have a Postscript controller can be controlled with jtman/CRD Business 3.
jtman/crd Business 3 is the ideal combination of a job ticket for secure and cost-saving communication between users and in-house printers with powerful job control and finishing functions.